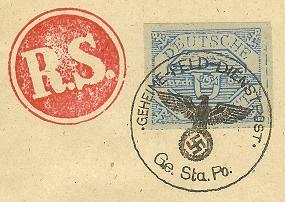 U-Boat Post, March 1945, stamp issued on Hela Peninsula, Danzig, for mail sent via submarine to the unoccupied German ports. During WW-II the 51st infantry division of the German army was based on the Hela Peninsula, on the gulf of Danzig/ Gdansk (Poland, Baltic Sea). In March 1945 the troops were cut off the mainland but were serviced with supplies by submarines. Mail service was to be provided to these troops by submarine and a special stamp for this purpose was designed by one Bruno Paetsch of Danzig. It was offset lithographed by the army corps map unit on the Hela on paper originally intended to be used for the production of military maps. The stamps were printed in sheets of 150 stamps, imperforated and without gum. Total printing 150,000. Although these stamps were rationed amongst the soldiers because of the limited space on the submarines for carrying personal mail, Hela was regularly served by surface vessels of the navy until the war ended on May 8, 1945, so that this stamp was not used as originally intended.